Stand Up To Cancer (SU2C) and Cancer Treatment Centers of America (CTCA) have collaborated on a new print, radio and digital public service campaign featuring actress and cancer survivor Christina Applegate. The public service announcement (PSA), entitled “When You Don’t Know What to Say, Stand Up,” highlights the ways friends and family can provide support to a loved one diagnosed with cancer. One in two men and one in three women will be diagnosed with cancer in their lifetimes. When someone you love is confronted with a cancer diagnosis, it can be difficult to know just what to say or how best to help. The PSA encourages friends and family members to visit showthatyoucare.org, a website that offers suggestions and tips to comfort and support newly diagnosed loved ones. 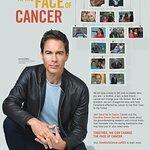 The collaborative campaign represents the continued dedication to empower cancer patients and their loved ones by both Stand Up To Cancer and Cancer Treatment Centers of America. In March 2012, SU2C and CTCA collaborated on a PSA entitled “QN2A, Better Questions, Better Care,” which focused on the importance of patient empowerment when confronted with a cancer diagnosis. For more information on the campaign, visit showthatyoucare.org.